So in those five generations, the longest lived was my dad, Ivon Walter Whimpey (1923-2009) at 86 years. The shortest lived was Frederick Oliver (1824-1855) at 30 years. Frederick died of colonial fever, a few years after arriving in Victoria from England. 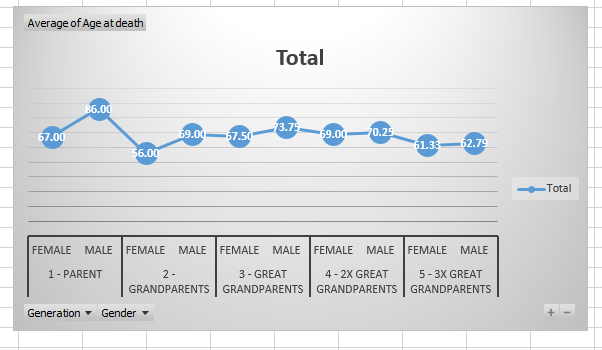 The following is a comparison between these figures, and my figures from last week post http://loiswillis.com/2016/07/31/sunday-afternoon-genealogy-fun-female-ancestors-age-at-death, when I did the females. I have heard that females live longer than males – not when it comes to my ancestors!